Do you want to see more of this property? Have a look at the virtual tour of this property and be able to walk through this home from the comfort of your own screen. 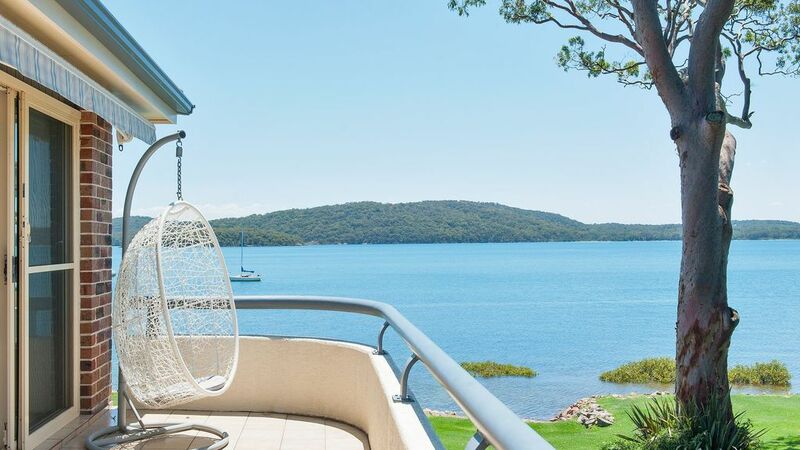 Set in a perfectly manicured complex, this two (2) bedroom apartment enjoys extensive water views across the Port Stephens peninsular to Tomaree & Yacaaba Headlands. The ultimate location at Kangaroo Point, is less than 100 mtrs from the Yacht Club, Soldiers Point Bowling Club & Salamander Shores. Features includes large balcony, spacious interiors with open plan living/dining areas flowing out to the balcony & views. There are 2 generous bedrooms with built-in wardrobes, second bedroom has a trundle bed and the landing in the hallway has 1x more single bed and 1x single trundle bed, both rooms include ceiling fans, modern timber finish kitchen with dishwasher, spacious modern bathroom, DVD & TV in lounge room, Outdoor furniture and BBQ on balcony, with a double security undercover car space. Linen not supplied, hire can be arranged at an extra charge. Blankets & pillows are provided in the property. LOCATION: This property is located in Soldiers Point only a short stroll from Salamander Bay Shores, Soldiers Point Bowling Cub and a few steps to Wanda Beach, only 5 mins to local Shops, Restaurants and takeaway shops, approx 10 mins drive to Salamander Bay Shopping Center and Nelson Bay CBD. Nelson Bay is well known for its dolphins & whales.These majestic creatures can be found frolicking off the main land in large pods.There are cruises that run daily letting you get up close and personal with these beautiful mammals. There are many places were you can hire the equipment you need to make the most of these water activities. If you have your own boat, Nelson Bay has its famous marina with all its facilities to cater for your needs. Port Stephen's also has excellent launching ramps. ... fun parks ... kids farm ... ten pin bowling ... horse riding ... bike riding ... nature walks ... museums ... historic buildings ... cinemas ... winery ... world class golf courses ... 4wd shopping. After your fun day out you can enjoy the vast variety restaurants and cafes to suit your taste and budget. This can be anything from fish'n'chips to an international cuisine. If you are looking for wining, dining and live entertainment all in one, try the great clubs and pubs that the area is well known for. However if that sounds like all to much and you would rather put your feet up and relax is no better place then Port Stephens. There is so much more than meets the eye to Port Stephens so why no jump in the car and we'll see you soon. Or if you from lovely Melbourne or there about grab a cheap flight. You'll be here in no time. Paradise is waiting. You have put it off long enough.